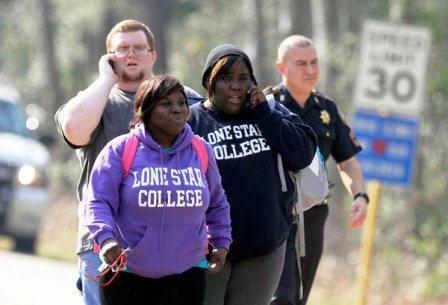 Lone Star Texas College Shooting 4 in Hospital After Shooting at Houston College Campus. In a shootout between two people, one of whom was shot. Two others injured in the crossfire and a fourth suffered a heart attack. This new shooting happens just a month after the place in Newtown, Connecticut reopening the debate on guns in America. HOUSTON: A 22-year-old man has been charged in the shootings at a Houston-area community college campus that left him and two others wounded. The sheriff’s office in Harris County, home to the campus, warned of a shooting around noon in a library. Jed Young, director of communications for the university, told CNN in a shootout between two people, one of whom was shot and is being held by police. Two other people were wounded in the crossfire and a fourth suffered a heart attack. Young could not confirm at this stage whether there are dead or the whereabouts of the second person involved in the shooting. “We know that there have been shootings and now people are confined on campus,” said the media responsible for the university, Vicki Cassidy, who offered no further details because the situation remains “very chaotic”. The U.S. television shows pictures of people running outside the educational system, as well as some people who have been moved on stretchers to ambulances. “I was in class and I heard about six shots. Everything happened very quickly,” he told CNN Amanda Vasquez, student campus. “Then we closed the door and turned off the lights. Called my mother,” he added. According to its website, the Lone Star College is the largest educational institution in Houston, with approximately 90,000 students in more than a dozen campuses. This new shooting happens just a month after 27 people, including 20 children, died in a Connecticut school in a shooting that has reopened the debate on the right to own and carry firearms in the U.S..
On 16 January, the U.S. president, Barack Obama, signed 23 decrees to promote the control of firearms.